"This serves as an important reminder that R.W. Wood wasn't the last or the only one to investigate the presumed heating effect of infrared-opaque glass. As Richard Lee shows here, many others explored this question and reached the same conclusion. You might notice, though, that meteorologist Lee uses some reverse logic in his explanation. 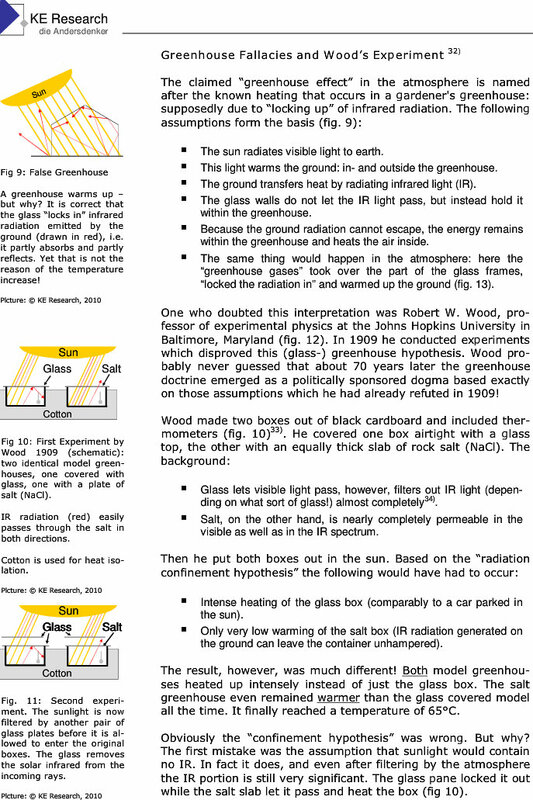 From greenhouse theory's inception, remember, a glass enclosure was alleged to prove the existence of what we now call "radiative forcing," i.e., heating caused by a build-up of infrared photons that cannot escape. As a result of this misconception it was extrapolated that certain atmospheric components behaved much like IR-opaque glass, with infrared radiators playing the role of an infrared barrier (illogically enough). But even after it was found that the very basis of greenhouse theory was phony, experts like Lee insisted that the atmosphere does do what a solid IR-opaque barrier somehow can not do, namely generate extra heat by radiative confinement. Flimflam excuse-making has a long tradition in climate science, then. It's not just a recent invention. Yet Lee was absolutely correct that there was no longer any excuse to teach glass-box radiative forcing: the evidence was in, and it was final. Nevertheless, as I demonstrate below, this deceptive crap is still being pushed on students and the public alike. The so-called radiation ‘greenhouse’ effect is a misnomer. Ironically, while the concept is useful in describing what occurs in the earth’s atmosphere, it is invalid for crypto climates created when space is enclosed with glass, e.g., in greenhouses and solar energy collectors. Specifically, elevated temperatures observed under glass cannot be traced to the spectral absorbtivity of glass. R. W. Wood demonstrated the misconception experimentally more than 60 years ago (Wood, 1909) and recently in an analytical manner by Businger (1963). Fleagle and Businger (1963) devoted a section of their text to the point, and suggested that radiation trapping by the earth’s atmosphere should be called ‘atmosphere effect’ to discourage use of the misnomer. Munn (1966) reiterated that the analogy between ‘atmosphere’ and ‘greenhouse’ effect ‘is not correct because a major factor in greenhouse climate is the protection the glass gives against turbulent heat losses’. In one instance, Lee (1966), observed that the net flux of radiant energy actually was diminished by more than 10% in a 6-mil polyvinyl enclosure. 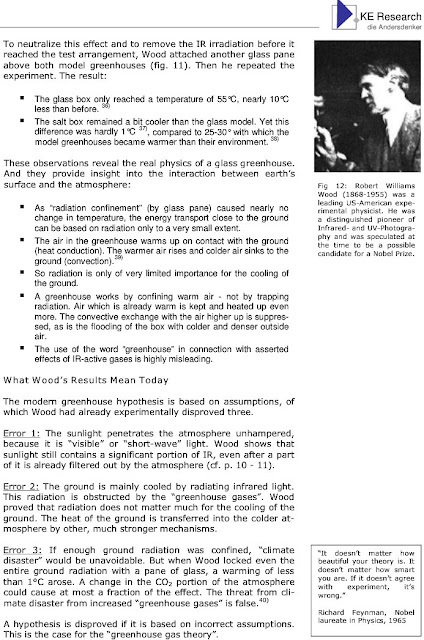 In spite of the evidence, modern textbooks on meteorology and climatology not only repeat the misnomer, but frequently support the false notion that ‘heat retaining behavior of the atmosphere is analogous to what happens in a greenhouse’ (Miller, 1966), or that ‘the function of the [greenhouse] glass is to form a radiation trap’ (Peterssen, 1958). (see also Sellers, 1965, Chang, 1968, and Cole, 1970). The mistake obviously is subjective, based on similarities of the atmosphere and glass, and on the ‘neatness’ of the example in teaching. The problem can be rectified through straightforward analysis, suitable for classroom instruction. And now a brief survey of what's being said in the current day. Lee's jaw would drop, I think. The realisation that Earth’s climate might be sensitive to the atmospheric concentrations of gases that create a greenhouse effect is more than a century old. Fleming (1998) and Weart (2003) provided an overview of the emerging science. In terms of the energy balance of the climate system, Edme Mariotte noted in 1681 that although the Sun’s light and heat easily pass through glass and other transparent materials, heat from other sources (chaleur de feu) does not. The ability to generate an artificial warming of the Earth’s surface was demonstrated in simple greenhouse experiments such as Horace Benedict de Saussure’s experiments in the 1760s using a ‘heliothermometer’ (panes of glass covering a thermometer in a darkened box) to provide an early analogy to the greenhouse effect. Greenhouse gases make up only about 1 per cent of the atmosphere, but they act like a blanket around the earth, or like the glass roof of a greenhouse -- they trap heat and keep the planet some 30 degrees C warmer than it would be otherwise. Greenhouse gases in the atmosphere behave much like the glass panes in a greenhouse. Sunlight enters the Earth's atmosphere, passing through the blanket of greenhouse gases. As it reaches the Earth's surface, land, water, and biosphere absorb the sunlight’s energy. Once absorbed, this energy is sent back into the atmosphere. Some of the energy passes back into space, but much of it remains trapped in the atmosphere by the greenhouse gases, causing our world to heat up. If the greenhouse is made up of glass, a second "greenhouse effect" comes into play as well. Glass is transparent to sunlight, but is effectively opaque to infrared radiation. Therefore, the glass warms up when it absorbs some of the infrared radiation that is radiated by the ground, water, and biomass. The glass will then re-radiate this heat as infrared radiation, some to the outside and some back into the greenhouse. The energy radiated back into the greenhouse causes the inside of the greenhouse to heat up. In a greenhouse, visible light (e.g., from the Sun) easily penetrates glass or plastic walls, but heat (in the form of infrared radiation) does not. The greenhouse effect refers to the physical process by which atmospheric gases allow sunlight to pass through but absorb infrared radiation thus acting like a blanket trapping heat. Life as we know it could not exist on Earth without the warming produced by the greenhouse effect. The "greenhouse effect" is the warming of climate that results when the atmosphere traps heat radiating from Earth toward space. Certain gases in the atmosphere resemble glass in a greenhouse, allowing sunlight to pass into the "greenhouse," but blocking Earth's heat from escaping into space. Why is this process called "The Greenhouse Effect?" Because the same process keeps glass-covered greenhouses warm. The Sun heats the ground and greenery inside the greenhouse, but the glass absorbs the re-radiated infra-red and returns some of it to the inside. The Greenhouse Effect obtained its name from the behavior of a greenhouse. A greenhouse's glass allows shortwave radiation to enter but then prohibits outgoing longwave radiation from exiting, thus warming the air in the greenhouse. The role of greenhouse gases in the atmosphere can be compared to the glass of a greenhouse: The glass lets the sunlight in, and the light warms the soil and plants in the greenhouse. These send out heat radiation, but when this heat radiation hits the glass, it doesn't pass through like the sunlight, but is absorbed and re-emitted by the glass. (Note, that glass is solid and also a barrier in the convection of warm air, so the comparison is not perfect.) This is in some way what greenhouse gases in the atmosphere do: They let the sunlight in, but they don't let the heat radiation from Earth out again. Light passes through the glass into the greenhouse and heats things up inside the greenhouse. The glass is then opaque to the infrared energy these heated things are emitting, so the heat is trapped inside the greenhouse. The reason that glass is such a valuable material is that it exhibits a very low absorption of electromagnetic radiation in the visible part of the spectrum, which is a wordy way of saying that it is transparent. It is not, however, transparent either side of the visible range (ultra violet and infra red). ...Thus the greenhouse glass acts as a one-way energy valve. ...Like the greenhouse glass, the water vapour acts as a one-way energy valve. If all the long-wave heat energy simply radiated back into space there would be very little warming above the surface, and Earth would be much cooler. However, certain gases in the atmosphere act like the glass panes of a greenhouse. Called greenhouse gases, these gases have physical properties that allow most of the incoming short-wave energy in sunlight to pass through. At the same time, they block or trap much of the outgoing long-wave heat energy (infra-red radiation) and re-radiate it back to the Earth's surface. Greenhouse gases like water vapour, carbon dioxide, methane and nitrous oxide trap the infrared radiation released by the Earth's surface. The atmosphere acts like the glass in a greenhouse, allowing much of the shortwave solar radiation to travel through unimpeded, but trapping a lot of the longwave heat energy trying to escape back to space. This process makes the temperature rise in the atmosphere just as it does in the greenhouse. This is the Earth's natural greenhouse effect and keeps the Earth 33°C warmer than it would be without an atmosphere, at an average 15°C. In contrast, the moon, which has no atmosphere, has an average surface temperature of -18°C. Some of you may wonder how a green house takes solar energy and turns it into thermal energy. A good example of this is something you can observe every day in the summer in you own car. It happens when you leave you car in a sunny parking lot with the windows up. The solar energy is passing through the glass and is heating the cars interior. Whats really happening is the short wave infrared waves are going in and are turning into long wave infrared waves, which cannot escape. On a global scale, carbon dioxide, water vapor, and other gases present in the atmosphere are similar to the glass in a greenhouse. Ultraviolet radiation from the sun (having a short wavelength) can pass through the glass. Once inside the greenhouse, the ultraviolet radiation is absorbed by soils, plants, and other objects. Upon absorption, it becomes infrared radiation or heat energy having a shorter wavelength. Because of this, infrared radiation cannot escape through the windows. The windows act like a large blanket in which they reradiate the infrared energy back into the greenhouse. This phenomenon naturally causes the overall temperature within the greenhouse to increase. This partial trapping of solar radiation is known as the greenhouse effect. The name comes from the fact that a very similar process operates in a greenhouse. Sunlight passes relatively unhindered through glass panes, but much of the infrared radiation reemitted by the plants is blocked by the glass and cannot get out. Consequently, the interior of the greenhouse heats up, and flowers, fruits, and vegetables can grow even on cold wintry days. The "greenhouse effect" is so called because it is analogous to the process that keeps the air inside greenhouses (and parked cars) warmer than the air outside. The glass in greenhouse windows is transparent to visible light radiated from the sun. This light heats the surface of materials inside the greenhouse, which emit longer wavelength infrared radiation. Infrared radiation cannot penetrate the glass and is trapped, causing the inside air to warm up. Visible sunlight enters the car through the windows. This light is absorbed by the interior of the car, which therefore is slightly warmed. The warmer interior then radiates infrared light to get rid of this extra energy, in an attempt to return to its original temperature. The infrared light is not able to escape from the car because glass is opaque to infrared light. This warming effect is called the "greenhouse effect" because it is the same process as that which occurs in a greenhouse on a sunny day. The glass is transparent to short-wave radiation but absorbs the outgoing long-wave radiation, causing a rise in temperature inside the greenhouse. A greenhouse uses glass windows to trap the infrared in the building, thus heating its air. In the Greenhouse Effect, gases in the Earth's atmosphere absorb the radiation and thus heat the air. In a garden greenhouse, visible light passes through the glass and is absorbed by darker surfaces inside. This absorbed energy heats up the materials, also warming the surrounding air. But convection is restricted by the enclosing glass and the inside temperature of the greenhouse rises. This is the main cause of warming in a garden greenhouse. However, in addition the warm surfaces re-radiate some of the absorbed energy, but at longer wavelengths in the infrared region of the spectrum. Some of this infra-red radiation is absorbed by glass and contributes to the warming of the greenhouse. It is this latter effect that is called the ‘greenhouse effect’. Greenhouse Effect is the natural process whereby gases in Earth's atmosphere act like the glass in greenhouse, letting the Sun's energy in, but keeping some of it from going back out. The "greenhouse effect" is the warming that happens when certain gases in Earth's atmosphere trap heat. These gases let in light but keep heat from escaping, like the glass walls of a greenhouse. The glass used for a greenhouse acts as a selective transmission medium for different spectral frequencies, and its effect is to trap energy within the greenhouse, which heats both the plants and the ground inside it. This warms the air near the ground, and this air is prevented from rising and flowing away. This can be demonstrated by opening a small window near the roof of a greenhouse: the temperature drops considerably. Greenhouses thus work by trapping electromagnetic radiation and preventing convection. The "greenhouse effect" is the heating of the Earth due to the presence of greenhouse gases. It is named this way because of a similar effect produced by the glass panes of a greenhouse. Shorter-wavelength solar radiation from the sun passes through Earth's atmosphere, then is absorbed by the surface of the Earth, causing it to warm. Part of the absorbed energy is then reradiated back to the atmosphere as long wave infared (sic) radiation. Little of this long wave radiation escapes back into space; the radiation cannot pass through the greenhouse gases in the atmosphere. To repeat Lee's words, "elevated temperatures observed under glass cannot be traced to the spectral absorbtivity of glass." But it's obvious that this doesn't matter to many educators, experts, and others who provide information, isn't it." Hey, idiot, Woods disproved the "transformation of wave-length" hypothesis for glass structures, not for the atmosphere! Why a Greenhouse is Warm. The comparatively high temperature produced within a greenhouse covered with glass and exposed to solar radition is usually held to result from a transformation of wave-length; that is, that the heat waves from the sun, which are able to penetrate the glass, fall upon the walls of the inclosure and raise its temperature; the heat energy is re-emitted by the walls in the form of much longer waves, which are unable to penetrate the glass, the greenhouse acting as a radiation trap. Prof. R. W. Wood, of Johns Hopkins University thinks it more probable that the part played by the glass is the prevention of the escape of the warm air heated by the ground within the inclosure. In some experiments which he conducted it was found that the loss of temperature of the ground by radiation is very small in comparison with the loss by convection, so that little is gained from the trapped radiation. From this it seems doubtful if the atmosphere is warmed to any great extent by absorbing the radiation from the ground.— Sc. Am. Apparently you are reading comprehension challenged. Read again the last sentence of your comment: "From this it seems doubtful if the atmosphere is warmed to any great extent by absorbing the radiation from the ground." Since you didn't know the essence of the "greenhouse effect" is that the atmosphere is warmed by absorbing LWIR radiation from the ground to create a non-existent tropospheric "hot spot," I understand why this is so hard for you. BTW idiot, there is no such thing as the "transformation of wavelength hypothesis for glass structures" except for you. Nice try, but nothing in Wood's experiment has anything to do with the troposphere. "From this it seems doubtful if the atmosphere (of the greenhouse, not the troposphere) is warmed to any great extent by absorbing the radiation from the ground." "In some experiments which he conducted it was found that the loss of temperature of the ground by radiation is very small (but not zero) in comparison with the loss by convection, so that little is gained from the trapped radiation." An amount of trapped radiation in a greenhouse which is very small, but not zero, multiplied across the entire troposphere, is enough to make a difference on the global mean temperature. In the troposphere, there is obviously no glass lid, so what heats greenhouses, preventing air movement, is obviously not what warms the Earth. Obviously, the mechanism that warms greenhouses is not the same as the mechanism that warms the troposphere. And really, only an idiot who never passed a science class would expect them to work exactly the same way. The name "greenhouse effect" is an allegory, nothing more. Everybody who knows anything about optical physics knows I'm right and you're lying. The variety of phenomena resulting from the selective absorption of certain wavelengths and the transmission of others is too broad to treat here. We mention only one important example, the "greenhouse effect." Visible sunlight is transmitted by Earth's atmosphere and heats (by absorption) both land and water. The warmed Earth's surface is a source of thermal radiation, the dominant emission for ambient temperatures being in the infrared. This infrared radiation, however, is strongly absorbed by CO₂ and H₂O vapor in the atmosphere, preventing rapid escape into space. Without this effect Earth would be a much colder place. An increased burning of fossil fuels could conceivably enhance the greenhouse effect by increasing the level of CO₂ and other "greenhouse gases" in the atmosphere. The term greenhouse effect is actually a misnomer, originating in the observation that the glass in a greenhouse, which is transparent in the visible but opaque to the infrared, plays an absorptive role similar to that of CO₂ and H₂O in Earth's atmosphere. This effect, however, does no contribute significantly to the warming of the air inside a greenhouse. A real greenhouse mainly prevents cooling by air currents. Although this point was demonstrated experimentally By R.W. Wood (1909), the contrary misperception persists even among scientists. 1. Nice try, the whole purpose of Wood's experiments was to simulate what happens in the atmosphere vs. as claimed by the Arrhenius "glass pane" "heat trapping" theory. The non-existent tropospheric hot spot is the result of computer models based upon the Arrhenius theory. 2. Nice try, admitting that the amount of "trapped radiation" is "very small" without apparently knowing the fallacious IPCC earth energy budget shows the "backradiated trapped radiation" of the atmosphere EXCEEDS THE TOTAL ENERGY INPUT OF THE SUN BY 48 Wm-2 (while also ignoring GHGs radiate ISOTROPICALLY). Greenhouse gas theory does not, and never did, rest upon increases in CO2 accumulating heat. Not in the atmosphere or anywhere else. The theory always rested upon a change in the temperature profile between surface and TOA with upper atmosphere becoming cooler, and lower atmosphere becoming warmer, but the average from surface to TOA remaining exactly the same. Nowhere in the theory is there any significant increase in heat in the first place, the effective black body temperature at equilibrium remains EXACTLY the same after doubling of CO2 as before. Thanks Joe, love your site and your work! Ummm, small correction that needs to be heeded. Glass is REFLECTIVE to IR. You can play this fact for yourself quite easily. Obtain a cheap webcam and remove the little red filter. Filter the light with say a bit of black film from a bin bag. Using any IR light source to illuminate you can see yourself in the mirror like glass but you cannot see through the glass. Glass warms up best with contact. Hope that helps. 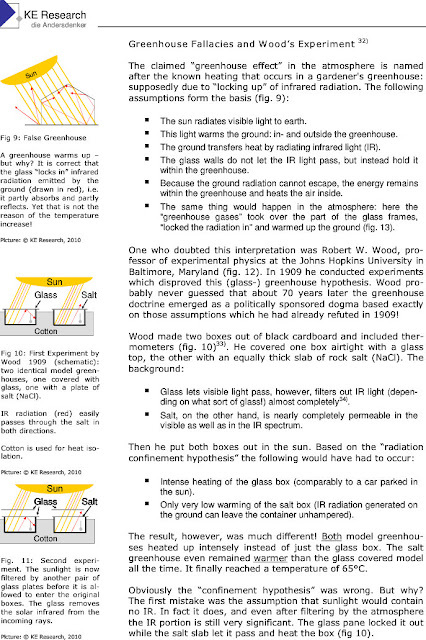 Uh, glass is reflective to IR, as demonstrated several times in the post and fig 10 & 11 above. I would venture to say that mankind's DEMONSTRATED OBSESSION WITH DEPOSITING MASSIVE AMOUNTS OF CEMENT in and around populated areas for buildings - coupled with the "desire" to blacktop nearly everything in sight - has a much, much larger effect in local AND global warming trends... at least in metropolitan microclimates.